Dr. Justin Filiberto is a planetary petrologist and geochemist. His work crosses disciplines and planetary bodies by combining investigations of basalt formation using petrology, mineralogy, geochemistry, and geophysics in order to constrain crustal and mantle evolution in the inner Solar System. His work spans multiple planetary bodies – Mars, Venus, the Earth, and the Moon – and is revolutionizing our understanding of the volatile content of planetary interiors by investigating the igneous diversity of planetary magmas. Building upon these previous studies, his current interests are to constrain the depth and thermal vigor of melting in planetary interiors, explore a terrestrial analog for Martian exploration, and investigate the effect of halogens on basalt genesis. Specifically, Justin’s recent work on mantle evolution has focused on understanding the mantle potential temperature and cooling history of Mars and Venus and the similarities and differences with the Earth. 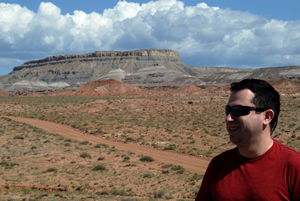 He has a very recently funded NASA PSTAR program grant to investigate an Earth analog, in the San Rafael Swell on the Colorado Plateau, where a mafic magma intruding sulfur rich sediments remobilizing the sulfur and potentially creating a habitable environment. He is also the lead editor of a book titled Volatiles in the Martian Crust, which provides a comprehensive review of volatiles in the Martian crust from studies of meteorite samples, as well as from the variety of landed missions, including the MER and Curiosity rovers.